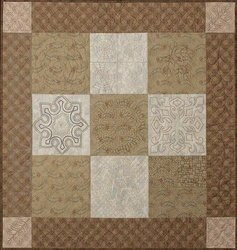 This class is a broad look at machine quilting techniques using your home machine. Students will bring a simple pieced top (from a pattern provided) ready to practice various techniques and styles of quilting. You will learn stitching in the ditch, using freezer paper templates, stitching through tracing paper, stippling ( both classical and innovative) as well as glean a wealth of tips to make machine quilting your own quilts easier and more pleasurable. Both beginning and intermediate quilters will benefit from this class. Sign up early, these classes fill quickly.